The Kiowa Black Leggings Society Honor Guard presented the colors during opening session. EDMOND—The 2018 annual meeting of the Baptist General Convention of Oklahoma (BGCO) featured many highlights, including the installation of Hance Dilbeck as the ninth executive director-treasurer in the state convention’s history. 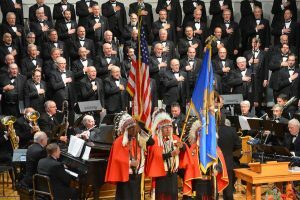 Military veterans were honored, and the Singing Churchmen of Oklahoma led times of worship in the opening of the annual meeting’s first session. The Kiowa Black Leggings Society Honor Guard presented the colors, as the National Anthem was sung. The Churchmen also sang a medley of all the military service songs, as veterans stood when their branch of the military was acknowledged. Hance Dilbeck’s installment as executive director-treasurer highlighted the first session. 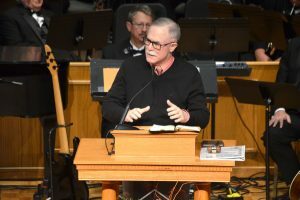 The former pastor of Oklahoma City, Quail Springs began serving in his leadership role in March 2018. The formal installment process was observed with a recommendation by Douglas Melton, pastor of Oklahoma City, Southern Hills, who was a member of the BGCO executive director-treasurer search committee. Messengers voted to approve Dilbeck for the role, which was followed by a charge given by Doug McClure, pastor of Hugo, First. The 2019 BGCO officers include, from left, Heath Tucker, second vice president; LeRon West, first vice president; Blake Gideon president; with BGCO Executive Director-Treasurer Hance Dilbeck. Dilbeck began his address thanking the many who have made it possible for him to begin serving as executive director-treasurer. He said it is an honor to serve Oklahoma Baptists and the Lord in this capacity. “I want you to know that I love you, and that I am one of you, because I need to tell you the truth,” Dilbeck said. He reported that Oklahoma Baptist work is in decline, referencing all accounts, including church membership, attendance, baptisms and Cooperative Program giving. Dilbeck said this is not the time for Oklahoma Baptists to retreat, but he emphasized the call to advance the Gospel. Dilbeck shared the history of the first meeting of Oklahoma Baptists, which happened 20 years before statehood, gathering in Tahlequah on June 1, 1883. He said they declared a threefold purpose. 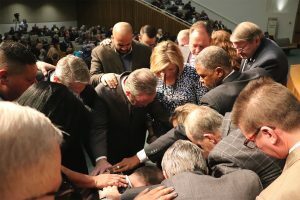 During Dilbeck’s installment as executive director-treasurer, Oklahoma Baptist leaders observe laying on of hands over Dilbeck and his wife Julie. Dilbeck concluded with a thought of the future. Messengers elected new BGCO officers during the Tuesday Nov. 13 sessions. Blake Gideon, pastor of Edmond, First, was elected president. Mike Keahbone, pastor of Oklahoma City, Cherokee Hills, was the other presidential nominee. 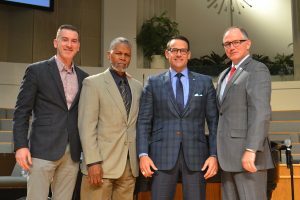 LeRon West, pastor of Tulsa, Gilcrease Hills, was elected first vice president, and Heath Tucker, pastor of Skiatook, First, was elected second vice president. Both were unopposed. Joe Ligon served his final year as BGCO president and oversaw annual meeting sessions. 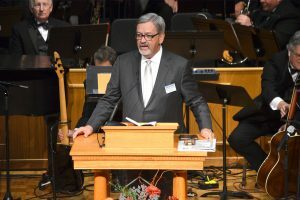 Joe Ligon, pastor of Marlow, First, gave his final address as BGCO president. Opening with the story of the Three Little Pigs, Ligon shared how important it is for churches to be strong in difficult times. Keith Wiginton delivered the annual sermon. Seven resolutions were approved by messengers at the 2018 Annual Meeting. The resolutions covered topics including appreciating the host church, Edmond, First; praying for the BGCO executive director-treasurer; emphasizing foster care and adoption needs in Oklahoma; calling for Christian civility in a hostile culture; addressing sexual integrity and accountability; opposing recreational marijuana and drug abuse; and expressing gratitude for pastors and ministers of the Gospel. During the miscellaneous business segment of the final session, Bill Barnett, pastor of Seminole, Indian Nations, made a motion that Dilbeck and BGCO leaders find an appropriate month to honor ministry wives. The motion passed. Connie Crew, messenger from Oklahoma City, Capitol Hill, offered a question from the floor, concerning the Langston University Baptist Collegiate Ministry (BCM) and former BCM director Verlene Farmer. Alan Quigley, BGCO Equipping Team leader, responded to Crew, saying Farmer has been involved in the recent Langston BCM emphasis and was present at the BCM building dedication. Doug McClure gave the charge during Dilbeck’s installment. 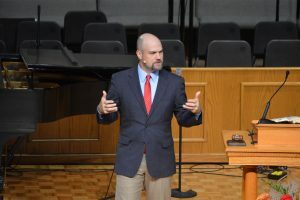 Brian Hobbs, editor of the Baptist Messenger, spoke in a video presentation of the new format the publication will observe in 2019, printing twice a month instead of weekly. 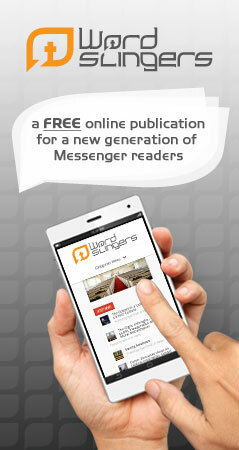 He also said BGCO-affiliated churches will receive print publications at no subscription costs, beginning in 2019. Messengers also approved the 2019 BGCO Financial Plan with the Cooperative Program objective of $25.5 million be distributed 60 percent to BGCO efforts and 40 percent to the Southern Baptist Convention. Multiple meals and auxiliary events were observed among Oklahoma Baptists, covering different ministries affiliated with the BGCO. The exhibit hall featured nearly 60 Baptist ministries, organizations and seminaries that meeting attendees enjoyed. Next year’s BGCO Annual Meeting was approved to meet at Broken Arrow, First on Nov. 11-12, 2019. To watch the 2018 Annual Meeting online, go to www.bgco.org/annualmeeting.